The late nascence of the industrial building, together with its strong ties to changing technologies and its relative anonymity, liberated the architect from tradition. 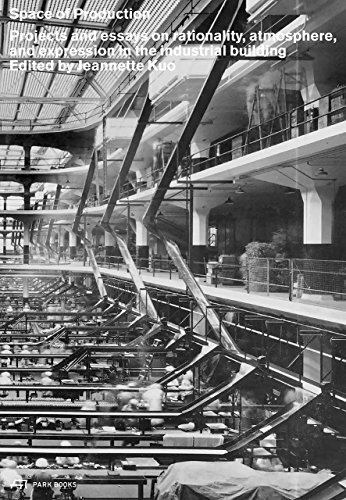 Factory buildings have been a testing ground for inventions in construction as well as new expressions and the non-mainstream while silos and reservoirs have been muses for architectural theory. Whether large halls or vertical stacks, whether generic or highly specific, experiments in the industrial realm have produced perhaps the purest relationships between structure, light, and space that we would find in any building type. The new book Space of Production, based on extensive research done by Atelier Kuo at Ecole Polytechnique Federale de Lausanne's School of Architecture, revisits spaces of production through seminal projects, text contributions, and studio explorations. Topical essays investigate specific aspects of the industrial building. The book features examples from the past 100 years with floor plans and sections as well as photographs. Work by students of Atelier Kuo is presented with photographs, brief descriptive texts and plans. Jeannette Kuo is a founding partner with Karamuk * Kuo Architects in Zurich and an Assistant Professor in Practice at Harvard Graduate School of Design. She was a visiting professor at Ecole Polyechnique Federale de Lausanne's School of Architecture 2011-14.